Here you don't have to worry about shaping, as you would with gnocchi. This recipe is for a side dish that deserves star billing. It’s a variation on the Italian potato dumplings known as gnocchi, which are often made with russets combined with flour, then rolled, shaped and boiled. They’re great, but a lot of work. When you use sweet potatoes instead of white, and don’t have to worry about the shaping, the dumplings get considerably easier. Just scoop up spoonfuls of dough and drop them in boiling water. Ultimately, you might even consider moving this dish from the side of the plate to the center. None of the carnivores at the table will go hungry, I promise. 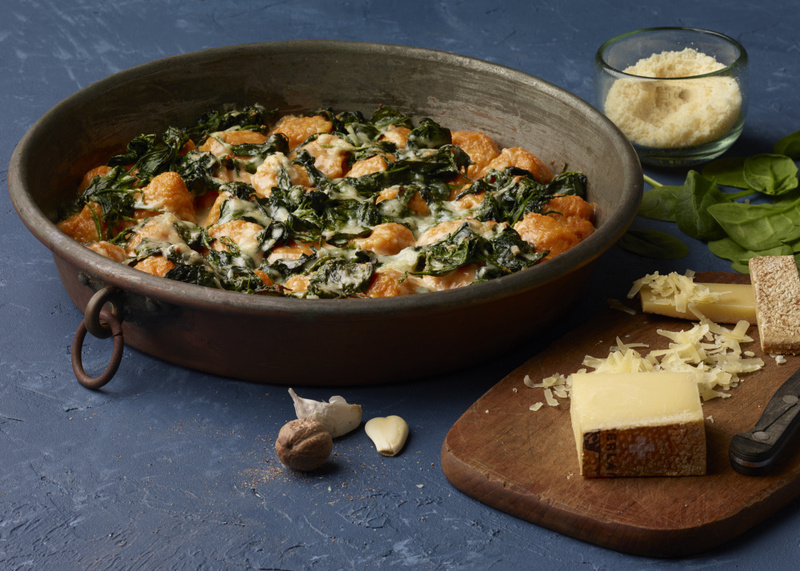 Sweet potato dumplings and spinach gratin is a variation on the Italian potato dumplings known as gnocchi. You’ll need a shallow, 14-inch gratin dish (or baking dish with a similar volume of 8 cups). Serve with roast chicken, pork loin or lamb, sauteed mushroom ragout and escarole, orange and red onion salad. Prick the sweet potatoes with the tip of a paring knife several times and place on a baking sheet. Bake (middle rack) until they are very tender, about 1 1/4 hours. Let them cool completely, then scrape out the potato flesh and put it either through a ricer or a food mill, or puree it in a food processor. Transfer it to a medium bowl; you should have about 1 3/4 cups. Discard the skins. Bring a large pot of salted water to a boil over medium-high heat. Grease the baking dish with a little butter. Lightly flour a work surface. Add the egg, the 1 1/4 teaspoons salt and the nutmeg to the pureed potato, stirring until smooth. Fold in the 1 1/2 cups flour and stir until barely incorporated. If the mixture is stiff enough so that an inserted spoon can stand in it, proceed with the next step. If it doesn’t, add a little more flour a few tablespoons at a time, stirring just until incorporated, to form a dough that holds its shape. Use a 3/8-ounce ( 100) disher or a level tablespoon to portion the dough into (rough-shaped) balls, placing them on the floured surface as you work. You should end up with about 36 balls. Add half the balls to the boiling water, reduce the heat to medium and cook the dumplings until they all float, for 2 or 3 minutes. Use a Chinese spider or slotted spoon to transfer the dumplings to the gratin dish. Repeat with the remaining balls. Melt the 2 tablespoons of butter in a large skillet over medium-high heat. When the butter just starts to brown, add half the spinach, stirring until most of the spinach has wilted. Add the remaining spinach and a hefty pinch of salt; cook until all the spinach has wilted and most of the moisture it gave off has evaporated. Add the garlic and cook, stirring, for 1 minute, then use a slotted spoon to transfer the spinach to the gratin dish. Combine the heavy cream and broth in a large liquid measuring cup, then pour it over the spinach. Sprinkle the cheeses evenly over the top. Bake (middle rack) for about 20 minutes, or until the liquid is bubbling around the edges. Serve hot.